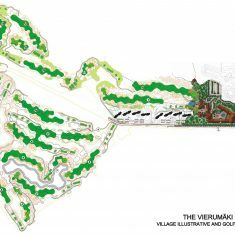 Vierumaki Golf Club | Vierumaki Golf Club | Ecosign Mountain Resort Planners Ltd.
Vierumäki Golf Courses are situated 20 kilometers north from the city of Lahti, Finland within the Sport Institute of Finland, which is a versatile centre of education, leisure and sports. It is situated on a beautiful Salpausselkä ridge in southern Finland. Vierumäki has three courses to offer: the brand new Cooke Course, the Classic Course and the par-3 Coach Course. These three courses combined with Vierumäki’s top class golf teaching make Vierumäki a great golfing destination to all level of players.